It’s like the hipster is a universal fall-guy – an entity created for the sole purpose of catharsis and mutual intimidation. If one person points out that it might not really exist, the world’s cultural infrastructure will collapse, culminating in World War III, because no-one has any direction for their first world frustration anymore. If it’s the case that hating on the hipster is a healthy anger outlet preventing World War III, then what I’m about to do is very irresponsible, but bear with me, it’s all in the name of independent music and the promotion thereof. I plan to begin by defining my terms. Undeniably, the term has become, frankly, opaque and overused – you might even say, ‘mainstream’ (see what I did there?) – and a traditional understanding of hipsterdom may be best gotten at with examples of things which belong to said class rather than attempting a catch-all definition, but regardless, I’m gonna give it my best shot. Not only this, but I’m going to focus on defining it in terms of agreed-upon hipster qualities. Now, this is a definition which even the simplest counterexamples will defy and so, Google, you lose. Hipsters are characterized by their rejection of the trending and fashionable. They epitomize a very unique kind of counterculture – most jokes at their expense rely on this. Let’s call it the ‘I was into x before it was cool’ principle (or BxCP for short) where x is some cultural artifact, be it musical, fashion-related, or what-have-you. BxCP means that hipsters engineer their interests such that mainstream popularity or acceptance is always one step behind. This foresight arms them with a kind of perceived superiority. Whether this superiority is genuine or not, who knows, but it goes some way to explaining why everybody hates them. 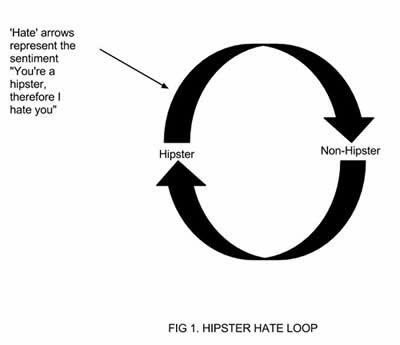 There’s a collective paranoia at work – everyone assumes hipsters think they’re better than them, so react defensively. translates to embracing alternative and niche culture, within which, of course, we have alternative and niche music – the kind that doesn’t see itself sitting comfortably on EMI’s lap in a warm cuddle with David Guetta and his greasy hair. Whether or not you like their reasons for championing the small, unsigned, or independent, they’re championing them, so my argument for the remainder of this article relies only on the hipsters’ penchant for independent music, and how their perceived characteristics affect their approach to its promotion. 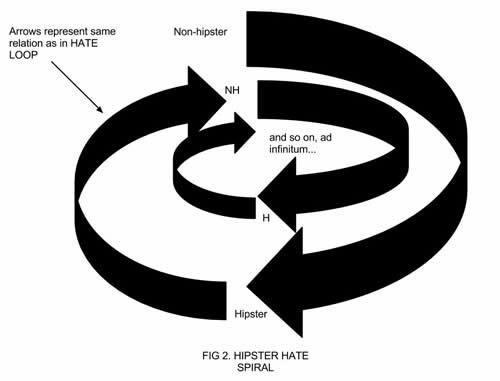 Every time I use the word ‘hipster’ from here on in, I am referring to an individual* who is perceived to champion the musical output of the unsigned, independent, or without significant reach until said creators draw wide cultural attention and this particular hipster’s mission is complete, prompting the process to begin again. They are viewed as aloof and ironic in their taste; their genuine interest is considered questionable at best, and their culture incorporates a high degree of mutual competition. *this definition does not rely on their existence – the universal belief in their existence and real non-hipsters acting as a collective mouthpiece for their perceived views is more than enough. In the constant quest for cool, change is inevitable. Change is good, however irrational. Change means expansion and expansion means that musicians can do more stuff. Hipster culture encourages the weird, and the not heard before. It champions creativity and makes room for originality. This fashion-like seasonal change cycle means musicians need to experiment to discover new and more interesting sounds. This is literally the definition of thinking outside the box. And to the rest of the world, in the words of Christina Aguilera, well known feminist icon and independent music advocate, the independent creator cries: can’t hold us down. A competitive societal structure means reward and punishment, and between criticizing whatever it is us normal folk are into (or worse, not criticizing us because they don’t care what we do) they criticize one another’s musical taste, and they criticize music. Now, don’t get me wrong, there are few things more irritating than trying to introduce music to someone and having them repeatedly pick holes in it, but this is a much larger cultural phenomenon than your usual house party struggle for alpha hipsterhood. Consider Pitchfork, regarded by many as the hipster musical bible. Pitchfork speaks for the hipster population, even if they don’t attribute hipster qualities to themselves, and while their decimal point review system is agonizingly infuriating, you can’t say they don’t have influence. Their criticism of the commonplace and their omnipresent pleas for innovation mean that making music within established boundaries will always warrant the deduction of points. Points, in this context, mean progress. How does that quote go? Something like whoever controls the media controls the population? Well, social media is the media of the people, and offers a brilliant marketing tool for independent musicians, and we have hipsters to thank for that. There are two reasons this magical union has been such a blessing for independent music. Firstly, everybody knows that the people who invented social media (for the most part) were not actual coding geniuses who have never been on a single date.. The truth is that most tech companies these days aren’t trying to build revolutionary AI. Instead, they’re all headed by insanely charismatic trend-spotters, who want to make some money under the guise of being a secret magical robot genius. If you don’t believe me, take a trip to East London. No-one’s actually doing anything, you know, important in a worthy sense, but whatever they’re doing, you’ll want to be involved. In short, hipsters invented social media, and social media is the best marketing tool an independent artist could ever hope for. All the independent artist has to do from now on is NOT ACT LIKE AZEALIA BANKS. Contrary to popular belief, not all publicity is good publicity. Secondly, hipsters OWN social media, meaning the independent artist doesn’t even need to be a social media genius to utilize this marketing tool. When you spend all your time listening to artists with no reach, you’ll find yourself seeing them in venues where no-one goes, and tiny venues are the cornerstone of independent music, allowing artists to connect with their fans on an intimate level, hone their live skills, and find a bigger audience. Keeping small venues open allows independent artists to reap the benefits of live performance. Basically, what I am saying is gigs are inherently good and if independent artists don’t play tiny ones, tiny venues will shut, and well, Muse aren’t going to play them, are they? Ticket sales mean musicians can eat dinner and have heating and eventually (hopefully), not have to work some tedious shop job and provide us with wonderful, inventive audio deliciousness full-time. YEAH. Any action which encourages the destruction of boundaries is a good one for innovation. Think of all those people who couldn’t sell a single record or get signed back in the day because they weren’t following any one artist, or genre, or were recombining existing genre elements to create new ones. You like Beck? Hipsters aren’t a new thing, and I hardly think nu-funk-country-hip-hop-electronica would’ve seen the light of day if hipsters hadn’t been footing his living costs. Whether or not hipsters actually really exist is neither here nor there. As a figure in our collective consciousness, they’ve done great things for the underdog, and their close connection with music means that most of that exposure has gone straight to musical underdogs. If you think that their public image problem is likely to discredit independent music or do its acceptance real damage then answer me one question and for a moment, disregard how much you hate them: do you think they’re cool? Yes, because they are. You can’t buy cool, something which independent music has always had in abundance, but you sure can sell it to people who think you can, and if hipsters want to promote fundraising for independent musicians, then I’m not going to stop them.